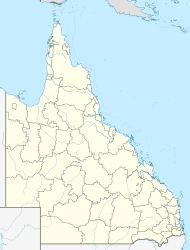 Kingaroy /kɪŋəˈrɔɪ/ is an agricultural town and locality in the South Burnett Region, Queensland, Australia. It is approximately 210 kilometres (130 mi) or about 2½ hours drive north-west of the state capital Brisbane. The town is situated on the junction of the D'Aguilar and the Bunya Highways. At the 2016 census, Kingaroy had a population of 10,020 with a median age of 37. It is known as the "Peanut Capital of Australia" because Australia's largest peanut processing plant is located in the town and peanut silos dominate the skyline. Kingaroy is also well known as the home town of former Premier of Queensland, Sir Joh Bjelke-Petersen. The origin of the name Kingaroy is usually claimed to be derived from the Wakka Wakka Aboriginal word for 'Red Ant'. The local Kingaroy Rugby League football team is known as "the Red Ants" and a Red Ant features on the old Kingaroy Shire coat of arms. A Wakka Wakka Word List provides the following explanation: "Derived from 'king', a small black ant, and 'dhu'roi', meaning hungry. The name was suggested by a local Aboriginal helper of the surveyor, Hector Munro, who surveyed the original grazing holding of this name, on account of these ants being a pest at the survey camp.". Munro selected Wakka Wakka words describing various species of ants when he surveyed a number of local towns, including Taabinga (dha' be'ngga) and Mondure (mon'dhur). A wheat field in the Kingaroy region. Rural settlement of the area dates back to 1843 when one of the first selections was made at Burrandowan (west of Kingaroy) by squatter and explorer Henry Stuart Russell. Even through Russell was reputedly the first European to realise the potential of the South Burnett, it was Simon Scott of Taromeo (now Blackbutt) and the Haly brothers of Taabinga who brought the first flocks of sheep to the area in the late 1850s. In 1878 the district where Kingaroy now stands was settled by the Markwell brothers. When the first resumptions were made from the enormous Taabinga holding, the brothers selected two adjoining areas and in 1883 these leases were converted to freehold and became known as the 'Kingaroy Paddock'. The corner of this paddock was located on what is now known as Haly Street, named after the brothers who settled at Taabinga Station about 12 kilometres (7 mi) south-west of present-day Kingaroy. A small, prosperous village grew up around Taabinga in the 1890s but the arrival of the railway in 1904 led to a land explosion around Kingaroy and the development of Kingaroy as it now exists. Taabinga quickly declined into a ghost town by the end of World War I and today the original Taabinga Homestead and a few outbuildings are all that remain of it. The area opposite Kingaroy Airport is today known as "Taabinga Village" but is really only a suburb of Kingaroy. The first Kingaroy Post Office opened by 1902 (a receiving office had been open from 1895) and was renamed Taabinga Village in 1905, when Kingaroy Railway Station office opened. This was renamed Kingaroy in 1907. The Taabinga Village office closed in 1929. The foundation stone of the Kingaroy Soldiers' Memorial Rotunda was laid on 25 April 1922 (ANZAC Day) by the RSL president Sergeant Norman Booth. It was dedicated on 29 June 1932 by Mayor-General Sir Thomas William Glasgow. The Kingaroy Branch of the Queensland Country Women's Association was established 22 August 1922 with Florence Daphne Youngman of Taabinga Homestead as the first president. In 1926 her husband Arthur Youngman donated land at 122 Kingaroy Street and Charlie Gills built the first rooms. On 24 November 1956 a hall was built at the rear of the rooms to allow for catering of weddings and functions. The Royal Australian Air Force had a significant operational and training presence in the region during the Second World War, the first squadrons deploying to the town's airport about mid-1942. At least eight squadrons were based at RAAF Kingaroy then (viz. Nos. 1, 4, 5, 6, 15, 75, 92 and 93 Squadrons), together with No. 3 Initial Training School. Aircraft operated there by the RAAF included Avro Ansons, CAC Wirraways, DAP Beauforts, DH Mosquitos, Curtiss P-40E Kittyhawks and Bristol Beaufighters. Kingaroy R.A.A.F. Post Office was open from 7 August 1942 until 28 February 1946. Kingaroy celebrated its Centenary in 2004. Kingaroy is also noted for being the first region in Australia to be placed on Level 7 Water Restrictions, which occurred on 1 October 2007. The Kingaroy Public Library opened in 1945 and had a major refurbishment in 2011. Kingaroy has experienced growth in population in recent years. Kingaroy itself is the largest town in the South Burnett and the region's commercial centre, offering all the services, shopping facilities and many of the industries generally expected in much larger centres. The town has its own hotels, motels, caravan parks, bed and breakfasts and cabins; and a range of restaurants, fast food outlets and petrol stations (including 24-hour petrol stations). Unlike many towns of its size, Kingaroy has its own shopping mall that includes Woolworths, Big W, and other retailers. Kingaroy also has an aerodrome a few kilometres from the centre of town and is regularly served by major bus lines. Kingaroy has the most cosmopolitan feel of any South Burnett township but it's still a relaxed, friendly and informal country town at heart. It has the typical low-humidity climate of all South Burnett townships and is surrounded by extensive (and very picturesque) farmlands interspersed with low rolling hills. The Booie Range, home to several wineries and cellar doors, lies immediately north-east of the town and the Bunya Mountains about 55 kilometres (34 mi) to the south-west. The township is situated in the middle of some spectacular scenery, and is popular for bushwalking. The Central Business District of the township is dominated by the Peanut Company of Australia's peanut silos (a local landmark). The Information, Art, and Heritage Precinct is located directly opposite the peanut silos. The complex includes the Kingaroy Regional Art Gallery, Visitor Information Centre, Heritage Museum, and an interpretative arena which highlights local industries. The Heritage Precinct also includes a number of historic buildings ranging from Carroll's Cottage (the first building constructed in Kingaroy) through to the Carrollee Hotel and the Shire's earliest Council Chambers (built in 1913). Kingaroy is also the new home for the Kingaroy Observatory (formerly Maidenwell Observatory) which was moved to its new site in Geoff Raph Drive, at the airport in early March 2015 and opened for business on June 29. Kingaroy Observatory is now a major tourist attraction for those wanting to eyeball the Universe up close, in large powerful telescopes, under a canopy of stars not affected by light pollution. Kingaroy State School opened its doors in 1902 and Kingaroy State High School  was established in 1958. In 2017, Kingaroy Magistrates and District Court underwent a $5.3 million refurbishment. The improvements included a full internal and external refurbishment and a new secure interview room for witnesses to give evidence. The courthouse was officially opened on 6 February 2018 by Queensland Attorney-General Yvette D’Ath. Kingaroy has a humid subtropical climate with warm to hot summers and cool to cold winters. Daily maximum temperatures range from 30 °C (86 °F) in January to 18 °C (64 °F) in July. On 12 February 2017, Kingaroy reached a new record high temperature, recording 41.6 °C (106.8 °F), while the coldest on record was -6.7 °C (19.9 °F) in July 1961. Due to its elevation, the town often records some of the coldest temperatures in Queensland during winter, dropping below freezing an average of 14.3 times per year. The annual average rainfall in Kingaroy is 779.1 mm (30.7 in), with the majority of it falling during the summer months. Frost is common from June to August, whilst sleet occurs occasionally, and light snow fell in July 1959. Winters are generally sunny with occasional periods of rain during the passage of frontal systems, whilst summers feature sunny days with frequent evening thunderstorms. Heavy rain events can occasionally occur at any time of year although are most frequent in late summer and can last from a few hours to as long as a week. On 27 January 2013, 230 mm (9.2 in) of rain fell in a single night due to the remnants of Tropical Cyclone Oswald, causing significant flooding in the town. The original weather station at Kingaroy's Prince Street has been recording rainfall since 1905 and temperatures since 1947. However it closed in 2000 to make way for a new, more advanced weather station at the town's airport. Traditionally, Kingaroy has always been the centre of Australia's peanut and navy bean industries but since the early 1990s it has also developed into one of the twin hubs of the South Burnett's rapidly expanding wine industry (the other hub is at Murgon, Redgate and Moffatdale, 55 kilometres (34 mi) to the north). Several wineries are located either in or very close to the town, along with the Booie Range Distillery which opened in 2001 — only the third distillery in Queensland. Droughts and uncertainty surrounding the region's annual peanut crop led some farmers to diversify and grow grapes. Rich volcanic soil, hot dry summers and cold winters proved to be ideal conditions for wine growing. Quite a number of vineyards were established in the region, and the success of their wine enables the South Burnett region, which includes Kingaroy, to promote the area as a tourist destination. The success of these enterprises has been largely attributed to the scenery of the location, and has benefited the local economy. Other than grapes, peanuts and navy beans, other crops commonly grown in the Kingaroy area are sorghum, wheat, corn, sunflowers, citrus fruits and duboisia, a kind of plant often used for pharmaceutical products. Kingaroy is centred on one of Australia's largest pork producing regions, and since the early 1960s has been home to one of Queensland's largest pig abattoirs, Swickers Kingaroy Bacon Factory. Hardwood Forestry Plantations have been prominent across the landscape since the early 2000s, having been established on many farms in the region as joint ventures between Landholders and the Queensland Government. The Plantation Forestry Industry is expected to provide employment for many locals in the future. Kingaroy has a vibrant sporting life. The town is home to a number of leading sports people including NRL players Chris Sandow and Chris McQueen Wallabies centre/fly-half Berrick Barnes, as well as former Australian cricket test and one day opening batter Matthew Hayden and Southern Stars women's cricket Australian representative bowler Holly Ferling. Kingaroy also has its own golf club, cricket club. Kingaroy Bowls Club has 2 Grass greens and plays on Thursdays and Sundays. Kingaroy & District Tennis Association has 8 synthetic grass courts, and a practice wall. The tennis club holds Thursday night fixtures and other social day matches during the week. It is also has a notable speedway track. Kingaroy has a rich history with Australia's four Football codes. Rugby League is arguably the most popular sport in terms of having a following, which reflects the passionate Rugby League culture in the Wide Bay-Burnett region. Kingaroy has a rugby league team that participates in the South Burnett competition, named the Kingaroy Red Ants. The town also has two Football (Soccer) teams, Gunners and Wests, that take part in the South Burnett's Football competition. Kingaroy is also home to the South Burnett Thrashers, a Rugby Union team that participates at B Grade level in the strong Darling Downs Rugby Union competition. In 2013, an AFL team, the South Burnett Saints, joined the Darling Downs competition. This is based in Kingaroy and plays at Lyle Vidler Oval. Kingaroy previously had junior and senior AFL teams in the Darling Downs AFL competition, with the Kingaroy Bulldogs senior men's side playing on and off from the early 1980s up until 2006, and the Kingaroy-Nanango Jets junior side playing up until 2009. The Kingaroy Showgrounds is also home to the Lucas Oil Kingaroy Speedway, a 400 metres (440 yards) clay oval. The speedway, which opened in 1968, is run by the South Burnett Speedway Club. Kingaroy has a vibrant cultural and social life and is home to an art gallery and several local craft outlets as well as a range of well-maintained and attractive parklands. The South Burnett Regional Council operates a public library in Kingaroy at Glendon Street. The town has two lookouts (at nearby Mt Wooroolin and Apex Park in Fisher Street) which provide striking panoramic views across the area. Live entertainment is held regularly at the Returned Services League club as well as several central hotels and in Kingaroy Town Hall. A half-dozen cellardoors are located either in town of very close to it. The South Burnett Musical Comedy Society (SBMCS) is based in Kingaroy and annually holds a minor production (e.g. a concert) around April/May and a major production (a full theatrical musical) around August to October. Previous productions have included Oklahoma!, Oliver!, My Fair Lady, Jungle Juice, Kismet, The Wizard of Oz, Little Shop of Horrors, Cats, and How To Succeed In Business Without Really Trying. In May 2018 they will perform a "Les Miserables" concert - a full sung through musical. Their major production of Disney's "Beauty and the Beast" will play in October not only in Kingaroy but will travel to Maryborough's Brolga Theatre and the Empire Theatre in Toowoomba. The group is celebrating its 30th Anniversary in 2019. The Kingaroy and Kingaroy Twilight branches of the Queensland Country Women's Association meets at the CWA hall at 122 Kingaroy Street. Major annual events include the Wine and Food In The Park Festival (held on the second Saturday in March); The Kingaroy Trail Ride held since 2009 at "Minmore" 36 kilometres (22 mi) from Kingaroy on the Burrandowan road (May 2011); the Kingaroy Show (held each May); the Burrandowan Picnic Races (held at Burrandowan on the outskirts of the Shire, also each May); the week-long UAV Outback Challenge flying robot competition (held in September on alternate years) and the Christmas Carnival (each December). ^ Australian Bureau of Statistics (27 June 2017). "Kingaroy (State Suburb)". 2016 Census QuickStats. Retrieved 29 January 2018. ^ a b "Kingaroy (town) (entry 18214)". Queensland Place Names. Queensland Government. Retrieved 13 May 2014. ^ a b "Kingaroy (locality) (entry 46232)". Queensland Place Names. Queensland Government. Retrieved 13 May 2014. ^ a b Australian Bureau of Statistics (27 June 2017). "Kingaroy". 2016 Census QuickStats. Retrieved 30 April 2018. ^ "Kingaroy", Sydney Morning Herald Archived 13 May 2009 at the Wayback Machine 29 January 2008. ^ a b Premier Postal History. "Post Office List". Premier Postal Auctions. Archived from the original on 15 May 2014. Retrieved 10 May 2014. ^ "SERVICES IN QUEENSLAND". The Brisbane Courier. National Library of Australia. 27 April 1922. p. 8. Retrieved 6 April 2014. ^ "Kingaroy Soldiers Memorial Rotunda". Monument Australia. Archived from the original on 7 April 2014. Retrieved 6 April 2014. ^ "HERE AND THERE IN QUEENSLAND". The Queenslander. National Library of Australia. 7 July 1932. p. 22. Retrieved 6 April 2014. ^ "Kingaroy". Queensland Country Women's Association. Archived from the original on 1 January 2019. Retrieved 1 January 2019. ^ "Public Libraries Statistical Bulletin 2016-17" (PDF). Public Libraries Connect. November 2017. Archived (PDF) from the original on 30 January 2018. Retrieved 29 January 2018. ^ Australian Bureau of Statistics (25 October 2007). "Kingaroy (Urban Centre/Locality)". 2006 Census QuickStats. Retrieved 12 November 2007. ^ Australian Bureau of Statistics (31 October 2012). "Kingaroy". 2011 Census QuickStats. Retrieved 5 June 2014. ^ "St Michael and All Angels Church (entry 602763)". Queensland Heritage Register. Queensland Heritage Council. Retrieved 12 July 2013. ^ "Carroll Cottage (entry 601901)". Queensland Heritage Register. Queensland Heritage Council. Retrieved 12 July 2013. ^ "Kingaroy Shire Council Chambers (former) (entry 602810)". Queensland Heritage Register. Queensland Heritage Council. Retrieved 12 July 2013. ^ "Kingaroy Peanut Silos (entry 602764)". Queensland Heritage Register. Queensland Heritage Council. Retrieved 12 July 2013. ^ "Burrandowan Station Homestead (entry 600648)". Queensland Heritage Register. Queensland Heritage Council. Retrieved 12 July 2013. ^ "Taabinga Homestead (entry 600647)". Queensland Heritage Register. Queensland Heritage Council. Retrieved 12 July 2013. ^ "Wylarah (entry 600646)". Queensland Heritage Register. Queensland Heritage Council. Retrieved 12 July 2013. ^ "Kingaroy Butter Factory (former) (entry 602809)". Queensland Heritage Register. Queensland Heritage Council. Retrieved 12 July 2013. ^ "Kingaroy SS". Archived from the original on 2 February 2017. Retrieved 30 January 2017. ^ "Kingaroy SHS". Archived from the original on 2 February 2017. Retrieved 30 January 2017. ^ "Schools opening dates". Archived from the original on 11 August 2017. Retrieved 30 January 2017. ^ "Media Statements". The Queensland Cabinet and Ministerial Directory. 6 February 2018. Archived from the original on 6 February 2018. Retrieved 6 February 2018. ^ a b "Kingaroy Prince Street". Climate statistics for Australian locations. Bureau of Meteorology. February 2013. Retrieved 2 March 2013. ^ "Table of Snowfall Events in South-East Queensland 1878-2015". Archived from the original on 29 August 2017. Retrieved 28 April 2017. ^ "Staying afloat". South Burnett Times. APN. 27 January 2013. Archived from the original on 28 January 2013. Retrieved 2 March 2013. ^ "KINGAROY AIRPORT". Climate statistics for Australian locations. Bureau of Meteorology. January 2014. Retrieved 9 January 2014. ^ "Locate a Library - South Burnett Regional Council". South Burnett Regional Council. Archived from the original on 31 January 2018. Retrieved 26 February 2016. ^ "Kingaroy Library". Public Libraries Connect. 15 August 2017. Archived from the original on 29 January 2018. Retrieved 29 January 2018. ^ Loftys, Tobi (13 December 2017). "Singers, time to dream the dream". South Burnett Times. Archived from the original on 28 March 2018. Retrieved 28 March 2018. ^ "Local Musical Going To Empire Theatre". South Burnett Times. 1 March 2018. Archived from the original on 28 March 2018. Retrieved 28 March 2018.